Our flying visit to Devon and Cornwall has so far been defined by moisture in all its many and varied forms – fog, mist, drizzle and plain old torrential rain – all destined to get you thoroughly wet. This is not so brilliant for garden visiting, or doing anything else for that matter, but is a reminder that West Country gardens are great because of the damp climate, not in spite of it. 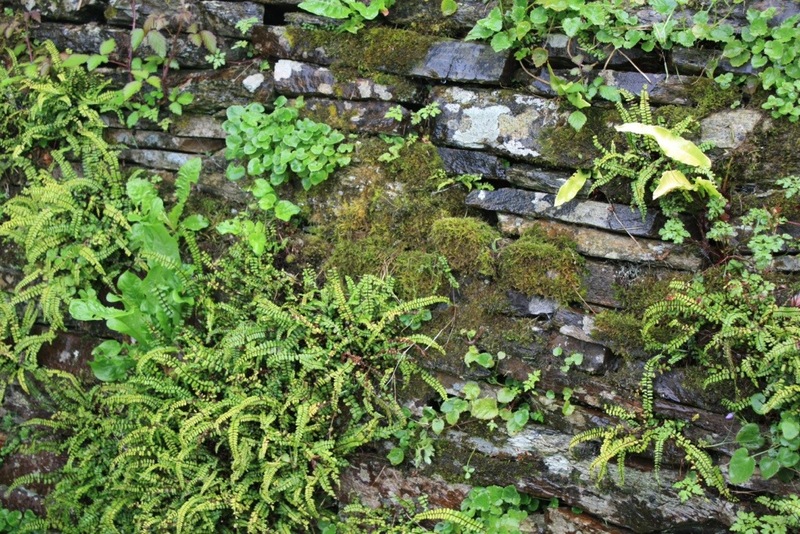 I was bought up in the West Country, so for me the sight of walls dripping with tiny ferns, trees covered in lichen and stones smothered by moss are like a homecoming. The mild, maritime microclimate of the western counties is completely unique, and to me, as a gardener, very special and exciting. 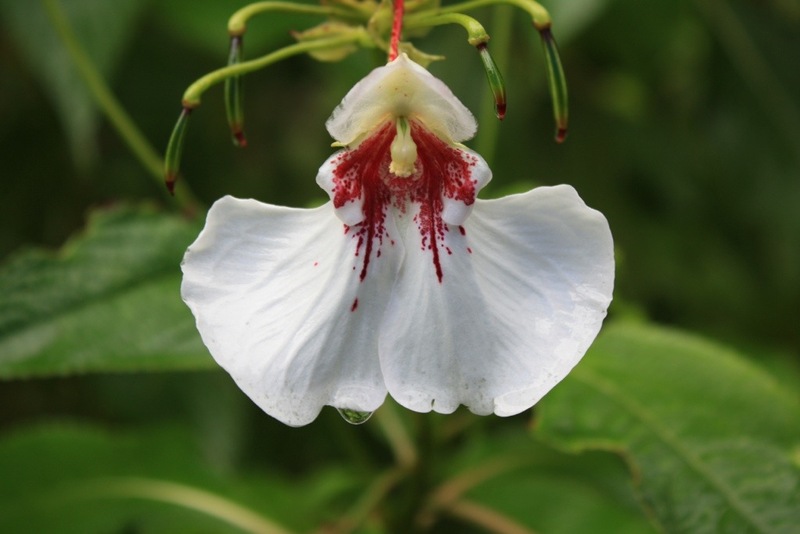 Above, an exquisite balsam flower drips with water. The plants stood almost 6 feet tall with only a handful of large solitary flowers. I have no clue what the species is, but isn’t it stunning? If anyone recognises this, please let me know. Today we visited The Garden House, one of the most picturesque and accomplished gardens in Devon, if not the UK. We were almost alone in braving the elements, which seemed so sad on a day which would normally be one of the busiest of the year. We could only appreciate the famous views of St Andrew’s Church through a veil of rain, but we got to enjoy them uninterrupted by the crowds. 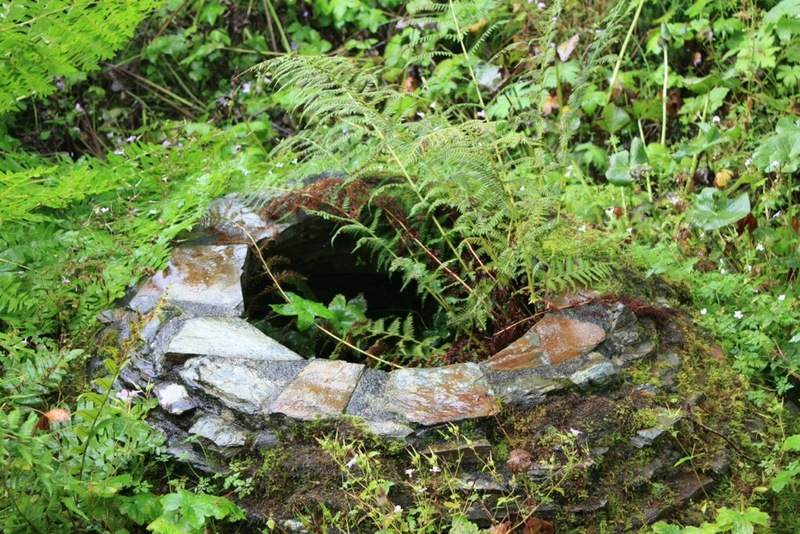 The garden paths were barely distinguishable from the narrow rills which weave their way down the wooded slopes. This is a garden that expects (and needs) 60 inches of rain a year (150cm) and this year it will certainly have surpassed that already. All this water is what makes plants from other cool, wet parts of the world feel so at home. Rhododendrons, balsams, birches, gentians, primulas, hostas, camellias and countless ferns flourish in the fertile acidic soil of the north facing slopes. 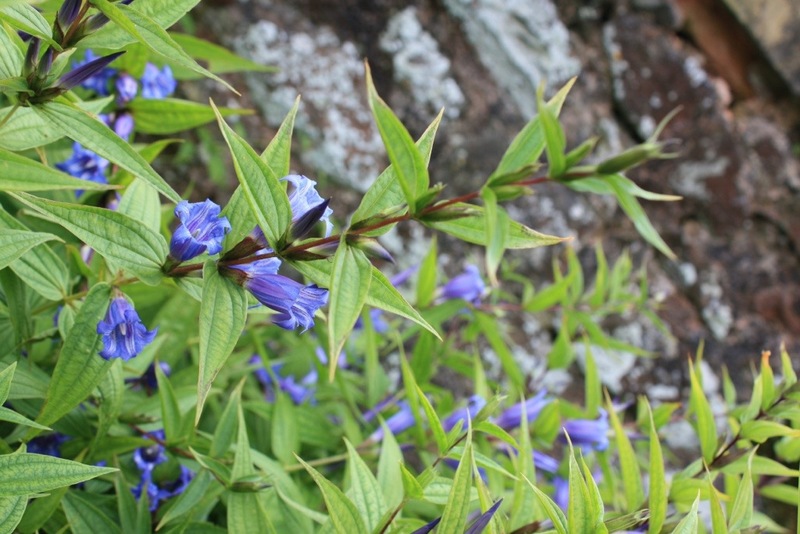 Here, the elegant arching stems and cobalt blue flowers of Gentiana asclepiadea shelter against a stone wall. 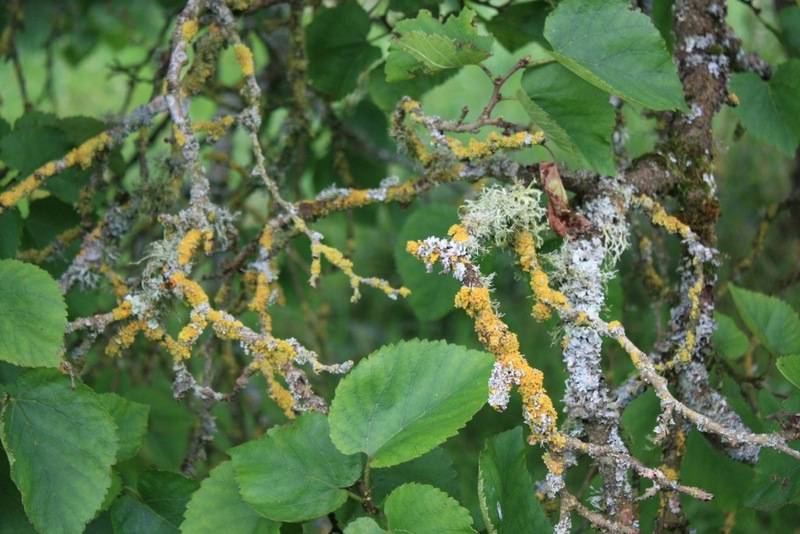 Below, the lichen-encrusted branches of an ancient mulberry (Morus nigra) at Killerton House earlier this week. So we may have got wet, but how lucky are we to be able to grow such a diversity of plants in this country? Is there a more accommodating climate anywhere else in the world than on our tiny island? What we lack in native flora we certainly make up for in welcoming plants from around the world. The Garden House is testament to that with all its rare treasures, but down here all you need to do is look around you to appreciate the rewards a damp, mild climate can bring. Lots more on The Garden House coming in a future post, but for now, please enjoy some wild, wet West Country foliage. Is the Balsam flower in the orchid family? It is quite lovely! Hi Laurie. I can see the resemblance. Apparently it has its own plant family, but is closely related to Impatiens (we call the annual ones busy lizzies). We have Himalayan balsam in the UK which is classed as an invasive weed. There were lots of non-weed balsams in this garden, but most of them were shorter, and very wet, so hard to take pictures of!